Surviving Madness Surviving Madness: GIVEAWAY: $100 Amazon Giftcard! 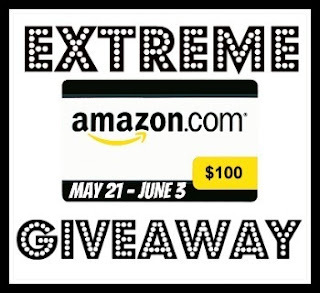 Welcome to the Extreme Amazon Giveaway! I've teamed up with other awesome blogs to give away a $100 Amazon Gift Card to one lucky reader! You can choose to do as many entries as you'd like; the more you complete the better your chances of winning! Giveaway ends June 3rd at 11:59 PM EST. Best wishes!